People and other animals have always been suckers for bling, it turns out. Jewelry and other things were being made from metal thousands of years before the development of smelting, or extracting metal from ores by means of high temperature. 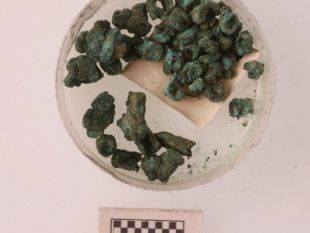 Copper beads made by hammering naturally occurring copper metal, or native copper, have been found from 10,000 years ago, though the earliest known smelting known wouldn't develop for another 5,000 years. So after we humans discovered how to extract metal from rock, we began to experiment with mixing different metals, as in alloying with copper. But why did we do it, and what did the earliest smelted alloys look like? It bears noting that gold and copper are relatively soft metals, so even putting aside the scarcity of the resource for gold, they were sub-ideal for making weapons, for instance. Stick a pure copper spear into a boar and all you get is a very angry boar. One motivation to monkey with alloys could be to make a tougher metal that doesn't bend so easily. But another motivation may have been the dazzle factor, concluded Dr. Miljana Radivojevic, lead author and researcher at the McDonald Institute for Archaeological Research, University of Cambridge and the international Serbian-English team, in a paper published in the Journal of Archaeological Science, in Elsevier. People seem to have agreed over the millennia that gold is pretty, and it's also rare. It seems that the prehistoric peoples of the Balkan were "faking" gold – making alloys to look like it. One reason we didn't realize that the ancients were apparently mixing metals to make gold-looking alloys, is that until now, we didn't know what the alloys looked like when manufactured some 6,500 years ago. Gold is a noble metal that doesn’t corrode and doesn't change color over time, and we know very well what gold alloys look like. Most other metals do change color. The surface of silver artifacts turns black; the surface of copper ones turns green and a patina forms. So, we could only guess at the actual hue of various copper alloys when they were forged. The Serbian-English team reached the conclusion that aesthetics were crucial in the development of the first known copper alloys, after recreating 64 alloys of copper mixed with arsenic and/or tin, and building a diagram mapping the colors that these of variable copper-tin-arsenic compositions would have originally had. 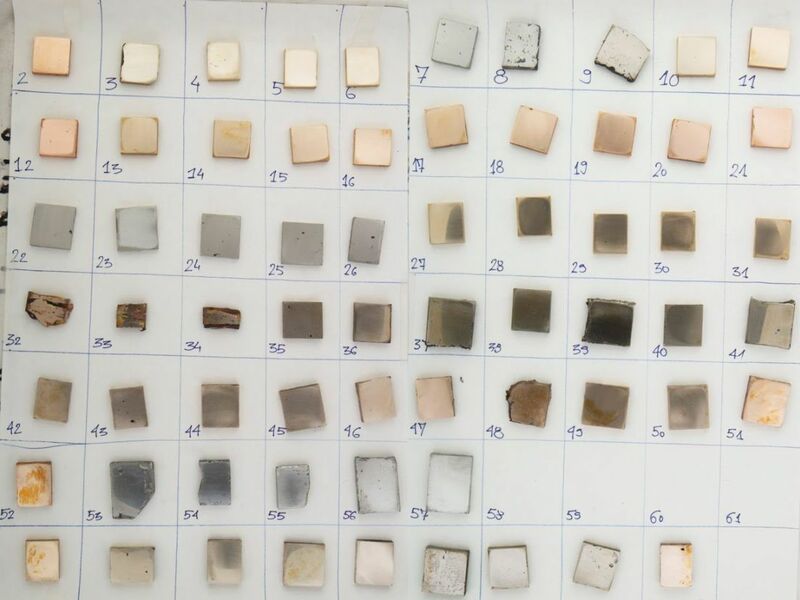 They then generated a color chart of alloys, and now we know what the ancient bling really looked like, Radivojevic says. After realizing the copper alloys seem to have been made to look like gold, the team concluded that innovation by the ancients was probably driven more by look than efficiency. The ancients wanted their metal to look like gold, rather than deliberately experimenting to make a tougher weapon or tool. They wanted to dazzle. Modern jewelers wanting to adjust the color of gold by adding other metals ultimately created a "gold diagram". While researchers had made attempts to make copper-arsenic and copper-tin alloys, and measure color, none merged into making a large ternary diagram with all three elements, as this team created. "Part of the problem is alloying with arsenic, which is a hazardous substance and requires a special license for handling in laboratory. 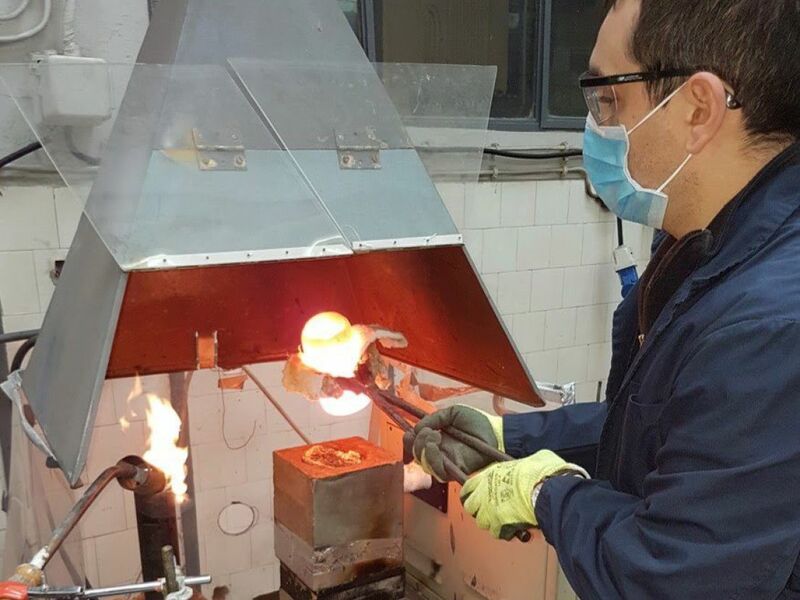 We were lucky to have licensed partners in Serbia led by Professor Kamberovic, at the Faculty of Technology and Metallurgy," Radivojevic told Haaretz. 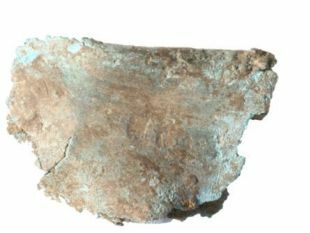 The study had been prompted by the 2013 discovery of the world's earliest tin-bronze artifact at the Vinča-culture village of Pločnik, in south Serbia. A piece of tin-bronze foil, clearly the result of smelting, was unearthed in an occupation layer dated to the mid-5th millennium B.C.E. (see picture). The Vinča-culture discovery threw back the onset of alloying by some 1,500 years. In any case, the foil had definitely changed color with age. Today it looks greeny brown. What did it look like then? And, inquiring minds wondered what, if any, significance color played in the evolution of metallurgy. "The copper-tin-arsenic ternary color charts enabled us to reevaluate the claim that early tin bronzes in the Balkans had a distinctive golden hue," said Radivojevic, and reached the conclusion that they did. She believes the production of this alloy in the Balkans at the same time as gold may have been dictated by the demand for the "exotic" golden hue, or its closest imitation. "We now have the means to bring the original shine to the items that have lost their original aesthetic appeal during several millennia of deposition below ground," stated Professor Martinón-Torres from the UCL Institute of Archaeology, which handled chemical and colorimetric analyses for the study.